My sisters anniversary is this week, so of course I had to make a special card. What better way to say congratulations than with a wonderful greeting and an entry in the Penny Black challenge this week. 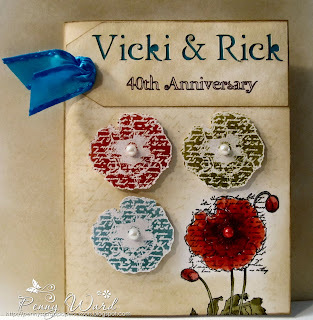 Happy Anniversary to Vicki & Rick...40 years together....WOW!!!!! Love how the colorful flowers pop against the soft muted background.